Patented First Aid device for the treatment of all insect bites and stings. Chemical free using the natural effects of concentrated heat. Temperature exactly maintained for optimal benefit without irritating the skin. Perfect for camping, outdoor lifestyle. Keep one in your First Aid Kit. Feel safe with German high standards of medical technology. Insect Bite & Sting Relief. Get instant relief from pain and itching. Bite Away® is a safe, easy, and chemical free way to stop the pain and irritation of insect bites and stings. 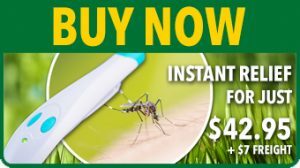 Bite Away®, is a pocket-sized First Aid medical device for the external treatment of insect bites and stings. Already being widely used in Europe, now Bite Away® is available in Australia. 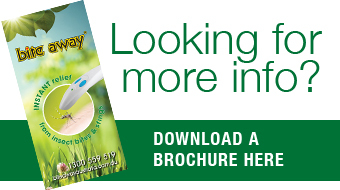 The bite away® is designed to be effective on any insect sting or bite that has a histamine reaction. Bite Away® uses heat to denature the proteins in the sting or bite. This instantly stops the pain and prevents the histamine release that causes the itch. It’s patented German technology consists of a tiny integrated micro-processor, which heats the skin to approx. 50 degrees for 3-6 seconds (3 seconds for children and 6 for adults). 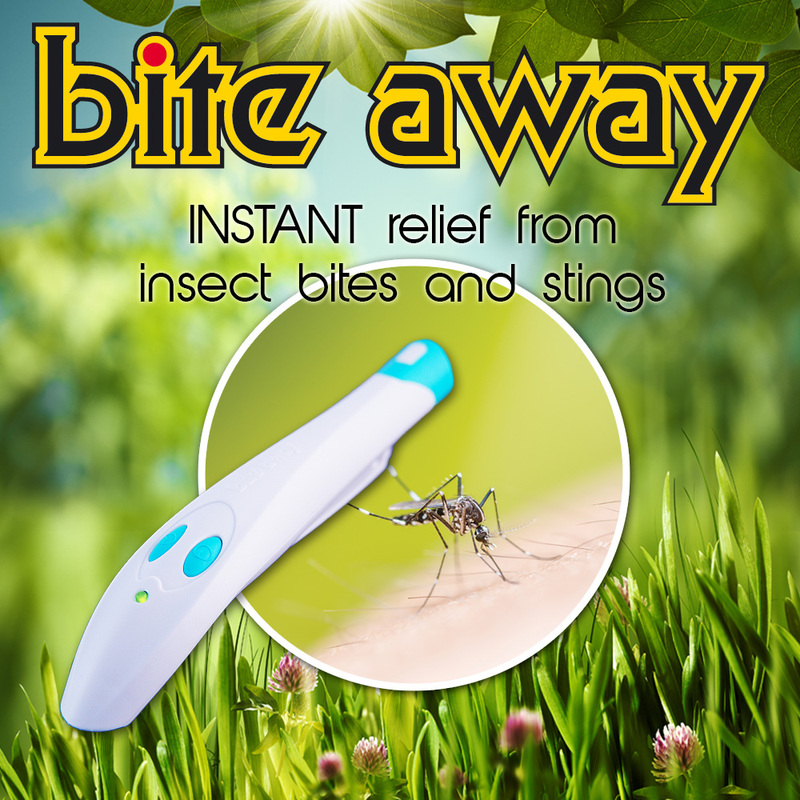 Bite Away® is called an insect bite healer as the device stops the pain and itch of an insect bite and also helps the bite site heal. This means the swelling of your bites reduces and disappear much faster than if they were left untreated. Long term scaring from insect bites is now a thing of the past. Bite Away® is compact, splash-proof, and portable. Perfect for the beach, the pool, and anywhere outdoors. It’s battery operated, taking two AA batteries, and with careful use will continue to last. Bite Away®is completely safe for everyone, including: children, people with pacemakers, or who suffer epilepsy, and pregnant women. It is ideal for those who have skin allergy reactions to bits and stings. Medical Device Class 2A approved by the Therapeutic Goods Administration of Australia (TGA) approval No. 223108. Hi I have 2 bite away gadgets, both bought at the Brisbane Camping and Caravan Show ( June) – first in 2014 and then 2016. We are going to SE Asia on 6th Dec I wondered if you send me 2 of these because I know I am going to need my little treasures. I love them and as I get massive reactions to sandflies, mozzies etc the biteaway works brilliantly for me. Even used it on a black ant bite and it absolutely got rid of pain and large swelling – was able to administer biteaway within few minutes of bite. Five weeks later I still have a tiny mark on the site of the bite but 2 zaps at the time of the bite took away pain and swelling. Amazing! We have used it in the Gulf, Kimberley\’s, Qld and anywhere in between. Great product!! My family camp, bush walk, kayak and all in all spend a lot of time outside. I get a terrible allergic reaction to mosquitos and sand flies and regularly end up on huge doses of steroids and phenergen when I get bitten. This device actually works. I usually have to use it twice that day (about 1hr apart) then its done. The itch doesn’t return. really. Its a total game changer for our camping and hiking trips now. We only ordered one (I was a bit sceptical) but I’m off to order at least one more so I always have one with me in my bag. I used your product on my son on the weekend. He was bitten by a bulldog ant out camping. My father in law had recently bought Bite Away and suggested I use it as I had forgotten most of things usually in my first aid kit. As his bite was extremely painful I was willing to use anything as I had recently been bitten weeks before with 2 hours of pain. Once we pushed the button my son said the pain pretty much had gone in 30 seconds. Hence why I am now buying it and a few more friends will be visiting in the next few days to buy some as well. Works very well on mozzie bites , only stings I have tried it on so far . Slight discomfort as it heats for a couple of seconds , but no more itch .